CANADIAN REGION: What are you doing in August 2017? Re: CANADIAN REGION: What are you doing in August 2017? Now the the cooler weather has arrived and I intended to get outside and get some gardening done, I managed to trip over the dog that I take out every evening and instead of walking the soft footpaths I took him into town so that I could check my mailbox. At 7:30 in the evening our Downtown is dead and usually there are few people around. I saw a neighour out walking and she crossed the road to say Hi! etc. and after five minutes chat we went out separate ways, and I at once came a cropper and fell heavily on to the concrete. That's when I found out how much harder concrete is than soft grass or dirt paths. Guthrie, the dog, had crossed in front of me and I had not been paying attention. My own fault. was also attended by their four-year old daughter who carefully wiped some blood off my knees. She wants to grow up to be a doctor. Anyway, they insist that they take me in the morning for eight o'clock when they open. I felt a bit of a fraud, but I see now, at nearly one in the morning, that I will appreciate their insistence that I go to get checked out. There is quite a deep cut on my thumb that they thought may need stitching. I now seem to have a number of sore places such as my wrists and one of my fingers so I have taken a couple of painkillers to help me sleep. Goodnight all. Oh, dear! Glad it wasn't worse than that!! Please let us know what the doctors say. Oh, Kelejan, OUCH! Be very kind to yourself for a long time. It could take weeks for all the sore spots to heal completely. (I know from experience when I tripped over a hose and did a face plant in the garden last year. ) What great neighbors and townsfolk you have. It's so nice to read about good people for a change. We need more "heart candy" in our lives. Thank goodness you are OK, a bit battered? Is anything broken? Or just sore all over? Ouch! Kelejan, I hope you are okay except for the battering. Did you go to the clinic today to have your thumb checked? Update? Kelajan ... How are you doing? That sounds like a nasty fall. I'm glad you had assistance to get home and to attend to the wounds. Please take care of yourself. Well, I am almost there. Still feeling a bit stiff in places and when going to the emergency they just looked at the scrapes and did not re-dress them. Going back with my neighbour (Guthries family) I had the scrapes covered up again and the thumb securely covered as well. I would have be very inconvenienced if the scrapes were not covered. I really did not need to have gone to emergency but it is certainly nice to be cossetted. I am not looking forward to the scabby stage. Today, at 5:30 in the morning I was looking at my apple tree and thinking about going out to pick up some of the windfalls and perhaps getting some of them into the garbage can as it is garbage pick-up day. I am glad I was taking my time to think, as all of a sudden a huge black bear crossed from under the tree and walked across my garden and up the hill. I reported it to canadawildlifebc but told them it was not threatening. Tonight I took Guthrie for his evening walk and he seemed to be very glad to see me, if only to get away from the attentions of his adoring four-year old little girl who has two new kittens to look after. They look like Pal must have looked when he was a kitten, grey girl tabbies with a hint of orange. Impulse from the S.P.C.A. Perhaps tomorrow I will be back to doing some gardening, first of all to pick up the windfall apples before I get fined. I thank you all for your good wishes; along with my neigbours and other friends, I feel very much loved. Good to hear from you, Kel. Glad you're healing okay. Too many apples to compost? Wish I had that problem. @SwampTroll wrote: I love the rain that we've been getting. Now I just need some genuine heat for my peppers. My jalapenos and poblanos seem to be okay, but my purple peppers aren't setting properly. Heat? You want heat? Just tell me where to send it and you can have all you want. SE New Brunswick please. Pour it on! I'm tired of having to be bundled up on my way to work. KJ, Thank you for the update. I'm glad you are on the mend. I'm surprised Guthrie isn't standing by the door with his leash in mouth. Some people just don't understand what pets need. @sanderson wrote: KJ, Thank you for the update. I'm glad you are on the mend. I feel better each day, sanderson. The aches and pains are diminishing, the worst part was last night when the dressing was removed from my elbow and that hurt a little bit. I know that there will come a day when I suddenly realize that I had forgotten it all. Guthrie is standing by the door when I knock and he comes rushing out and his little girl always hands me his lead. The bear was back this morning. I did not see it but was warned by my neighbour. It seems that there has been no let-up in bears this year. I picked up another three grocery bags of apples yesterday but there are heaps more to be picked up, and I am a little wary of those bears being around while I am working there. I am considering chopping that tree down as it is causing me so much work. It will be a shame as the tree is producing so many apples after years of neglect; the result of laying wood chips down three/four years ago. The tree is right on the boundary of my land and many of the apples fall on to next door's driveway as there is no fence, they do not pick up the windfalls. Each neighbour (four of them since I moved in) has in turn said they will build a fence but so far has never materialised. I also have to pick up windfalls from the apple tree next to my own driveway, the tree that never gets pruned and also attract the bears because those people never pick-up either. This weekend I hope to prepare a bed for lettuce/radish/spinach etc. now that the weather is more bearable. We could do with some rain, just a few mms since June 20th. Keep on mending, KJ! Regarding the apple trees, any chance to radically prune them so only a few fruit bearing limbs are left on your side? Depending how far the trees were planted on the property lines, maybe columnar / cordon style? I only have the one tree and I am certainly going to take off some more tree limbs for next year. I had about half the tree taken down early this spring and it seems as though the tree has already replaced everything taken away. A few minutes ago there has been a brown bear going through my yard and I will phone the Bear people to report it. That makes three different bears in the last week. There has been an increase in bears this year, and there has also been an avalanche of kittens as well. Nothing to do with SFG. Just caught up with this thread - wow Kelejan, glad you are okay! The bear problem sounds nerve racking also. Hope you get your apple situation sorted out! 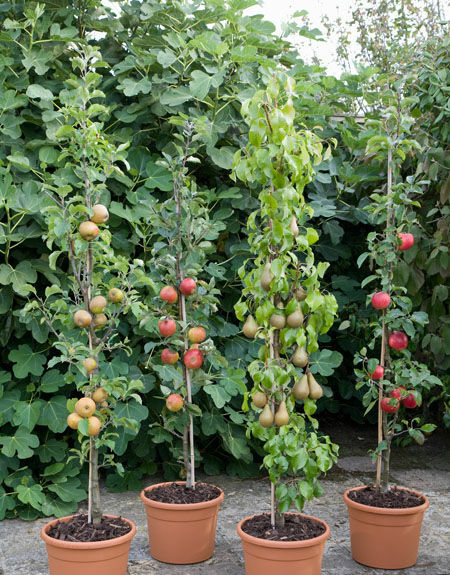 I would love to have one of those potted column style apple trees on my terrace! From what I've heard though, potted apple trees are not easy to care for. Victoria in BC had the most percentage of the solar eclipse in Canada, about 91% I think. I was out in the garden clipping down lots of stuff that needed cutting down; the sunlight had a kind of orange tinge to it did seem a little eerie. The temperature was nice and comfortable so I was able to clear enough overgrowth to keep me happy for today. Yesterday I found a packet of photos taken in 1999 and by that time we had been in our little house for three years, and today I was saddened at how I had let the garden go back to nature after my dear husband died. There was a nice little pond that I had dug out, put rocks around it and it had a little fountain. My DH was unable to help due to his final illness and I did it for him and he got so much enjoyment out of it. He enjoyed watching the fish and looking at the birds' nests he had built and were occupied that spring. So today I started to reclaim that piece of garden, sans pond, and see how far I can bring it back to what it was and see how far I get by this time next year. Wonderful memories Kelejan. Blessings to you. @Kelejan wrote: Yesterday I found a packet of photos taken in 1999 and by that time we had been in our little house for three years, and today I was saddened at how I had let the garden go back to nature after my dear husband died. There was a nice little pond that I had dug out, put rocks around it and it had a little fountain. My DH was unable to help due to his final illness and I did it for him and he got so much enjoyment out of it. He enjoyed watching the fish and looking at the birds' nests he had built and were occupied that spring. So today I started to reclaim that piece of garden, sans pond, and see how far I can bring it back to what it was and see how far I get by this time next year. Are any of those pics online or can you scan them and post them. I'd love to see your little piece of paradise. @Kelejan wrote: Victoria in BC had the most percentage of the solar eclipse in Canada, about 91% I think. I was out in the garden clipping down lots of stuff that needed cutting down; the sunlight had a kind of orange tinge to it did seem a little eerie. The temperature was nice and comfortable so I was able to clear enough overgrowth to keep me happy for today. Aww! That is so sweet, Kelejan! There is an awful lot of work to do, so I am trying to tackle it half an hour a day. But first I have to repair a connection of my hosepipe. The connection is from a piece of brown rubber pipe from the house, that is connected by a Jubilee Clip to the hosepipe proper. I have cut off the piece of brown rubber that was leaking and had split, but so far I have not be able to take off the jubilee clip as it is all rusted solid. I have soaked that connection in a jar of oil overnight and still cannot move the screw that tightens the clip. What I need is a strong hand to turn the screwdriver. At the moment all my neighbours are away. I think I will have to waylay a passing gentleman who looks up to the job. I did that when I had a gas lawnmower that I could not start. That's why I have gone back to electric. Waylay a passing gentleman! Yes! I have done that too! Glad to hear that you are on the mend KJ. I was sorry to hear about you fall and bear trouble. We have been eating Lebanese and lemon cucumbers out of our garden lately along with sweet peas and a few cherry tomatoes. Last year I remember having many more Toms by this time- but we have been starved for sunlight this summer. The herbs and greens have done very well though. I just love getting those fresh herbs out of the garden to cook with them. We had a nice chive and basil pesto with shrimp and tortilinis last night- and herb crusted fresh wild salmon a couple of days ago. I need to remember to make basil ice cubes with oil to preserve them before the frost comes. The oregano is in full bloom. I think it is too late to harvest it. Is that right? This was my first year trying ground cherries- they did fine- but I don't think they are a big hit with the family. The peppers took a while to take off, but should be ready soon. Just received the sad news that our daughter-in-law's Mom passed away during the night. She went into the hospital only a few days ago, suffering terrible pain and had not been able to eat. She was diagnosed with stage 4 cancer and other complications. She was only 64 years of age.